According to the United Nations, “impressive advancements have been made on many health fronts. However, to meet the Sustainable Development Goals health targets by 2030, progress must be accelerated, in particular in regions with the highest burden of disease.” Quality research on the nexus between health and sustainable development will underpin global progress. This latest analysis builds on Elsevier’s Sustainability Science in a Global Landscape Report which was released in 2015 to coincide with the launch of the SDGs. The analysis shows, for the period 2012-2016, worldwide scholarly output for research linking education and sustainable development, and the related impact, growth and collaboration between researchers in the Global North and Global South. In 2017, an analysis of scholarly research on SDG 4was launched during the UN General Assembly. 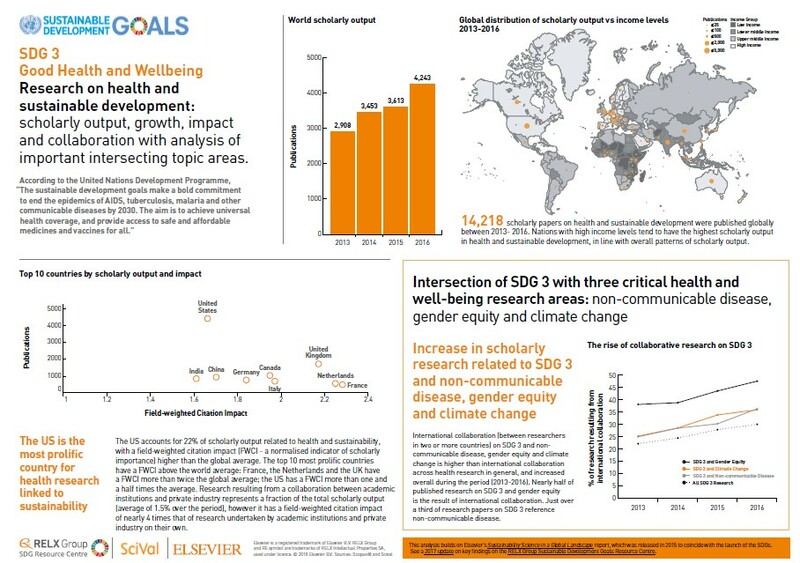 International collaboration (between researchers in two or more countries) on SDG 3 and noncommunicable disease, gender equity and climate change is higher than international collaboration across health research in general, and increased overall during the period (2013-2016). Research resulting from a collaboration between academic institutions and private industry represents a fraction of the total scholarly output (average of 1.5% over the period), however it has a field-weighted citation impact of nearly 4 times that of research undertaken by academic institutions and private industry on their own.